What if you could tap into the top talent in your industry, no matter where in the world they are? With the power of the mobile web, your all-star team is now "literally" at your fingertips. I recently had the privilege of meeting with Mr. 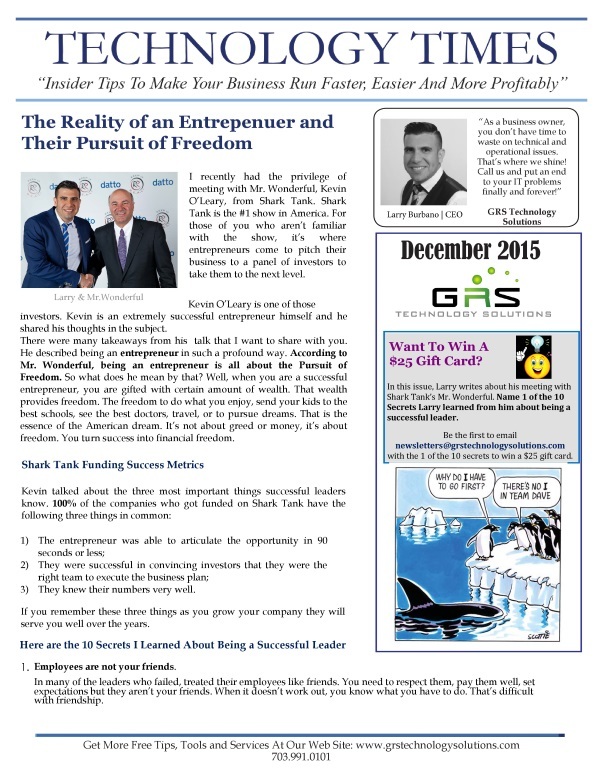 Wonderful, Kevin O’Leary, from Shark Tank. Shark Tank is the #1 show in America. For those of you who aren’t familiar with the show, it’s where entrepreneurs come to pitch their business to a panel of investors to take them to the next level. Considering a VoIP system for your business? 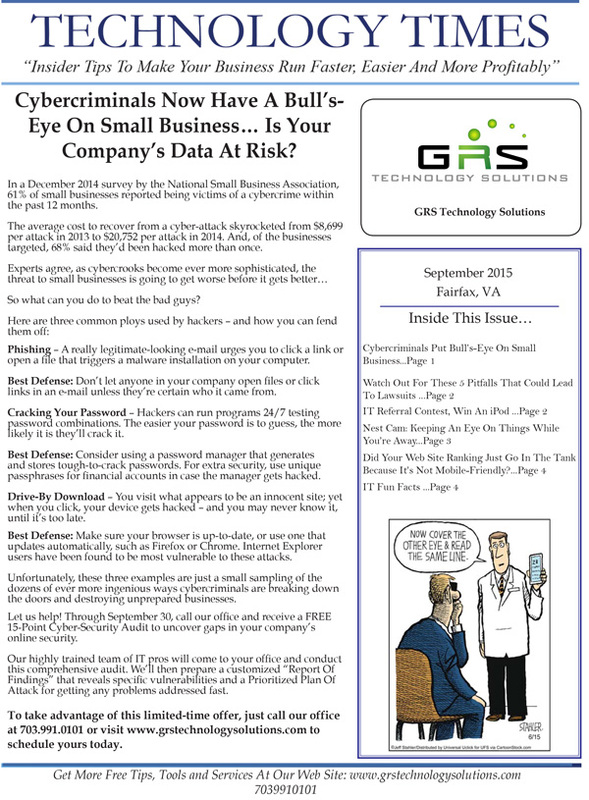 September 2015 Newsletters: Cybercriminals Now Have A Bull’s-Eye On Small Business... Is Your Company’s Data At Risk? 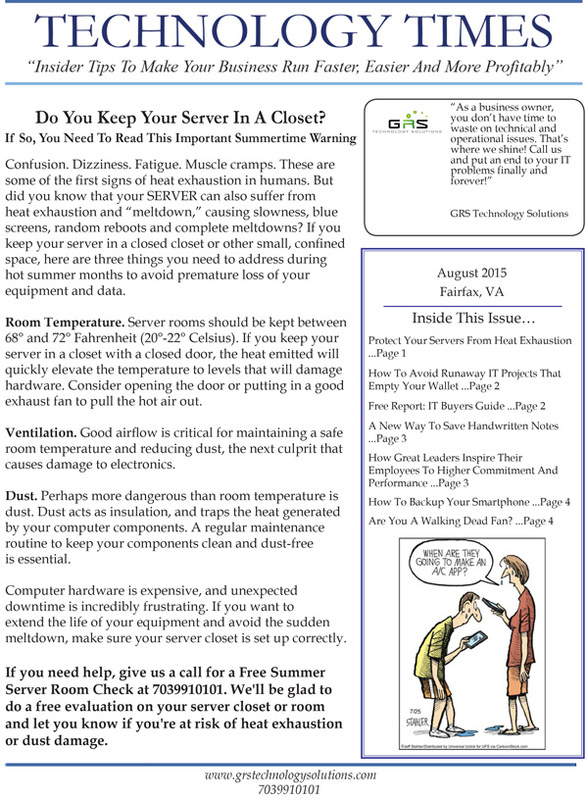 August 2015 Newsletters: Do You Keep Your Server In A Closet? 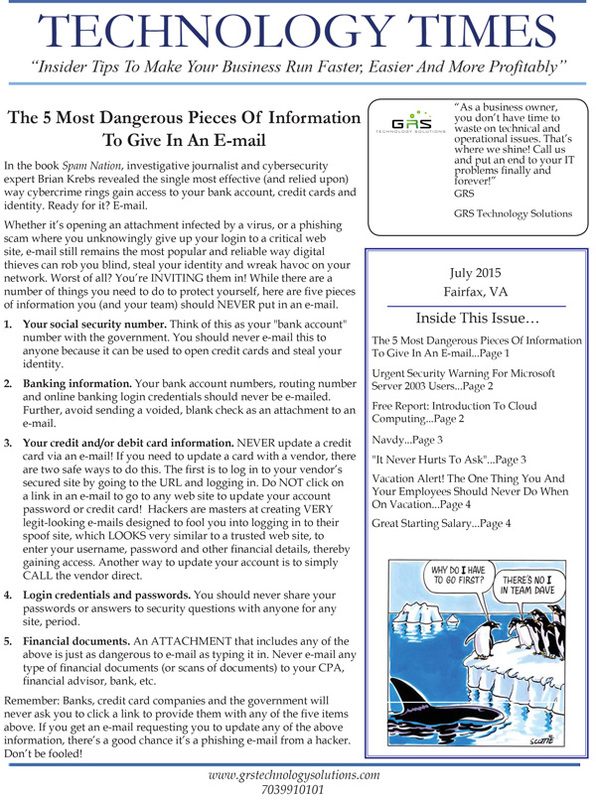 In the book Spam Nation, investigative journalist and cybersecurity expert Brian Krebs revealed the single most effective (and relied upon) way cybercrime rings gain access to your bank account, credit cards and identity. Ready for it? E-mail. 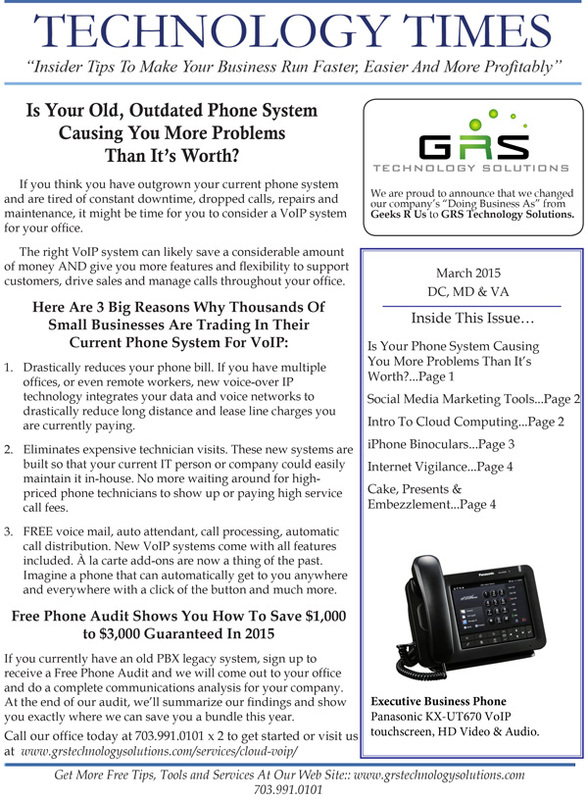 March 2015 Newsletters: Is Your Old, Outdated Phone System Causing You More Problems Than It’s Worth? If you think you have outgrown your current phone system and are tired of constant downtime, dropped calls, repairs and maintenance, it might be time for you to consider a VoIP system for your office. 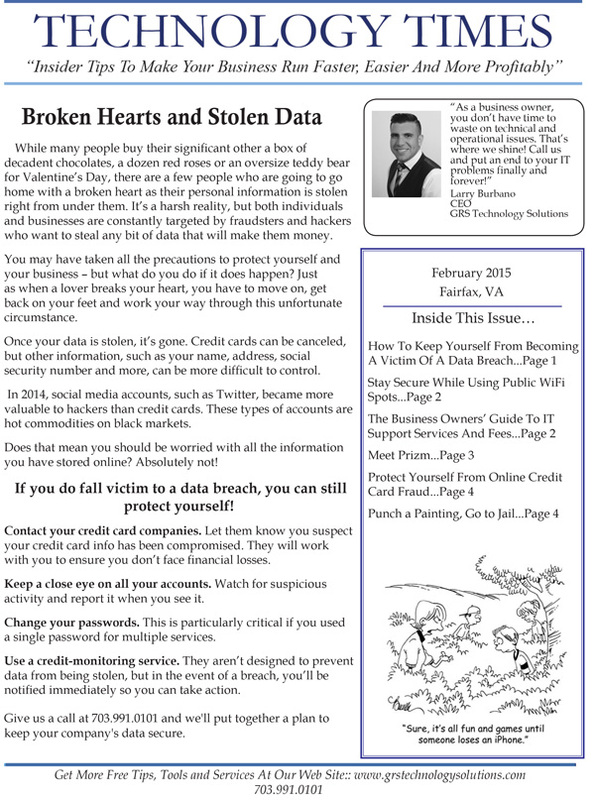 While many people buy their significant other a box of decadent chocolates, a dozen red roses or an oversize teddy bear for Valentine’s Day, there are a few people who are going to go home with a broken heart as their personal information is stolen right from under them. It’s a harsh reality, but both individuals and businesses are constantly targeted by fraudsters and hackers who want to steal any bit of data that will make them money. 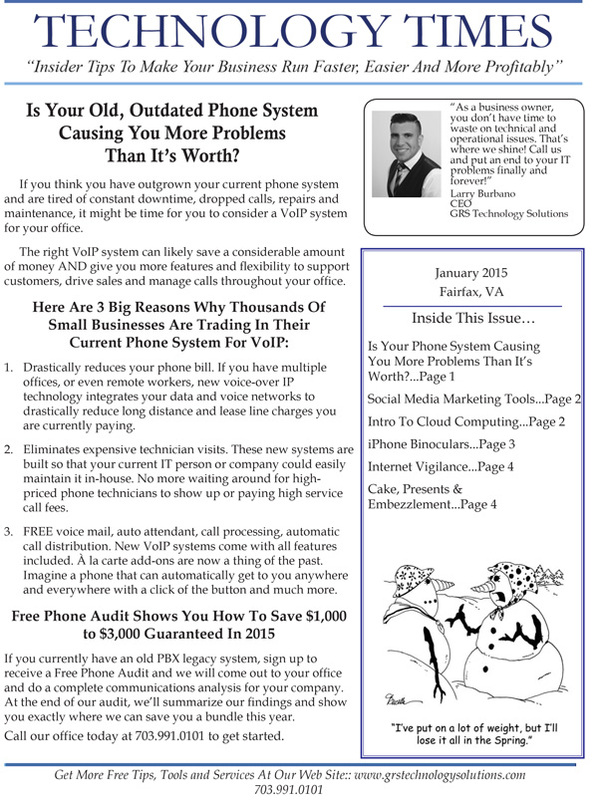 January 2015 Newsletters: Is Your Old, Outdated Phone System Causing You More Problems Than It’s Worth? As a business owner who also spends time working from home, do you make assumptions about your home’s wireless network security? 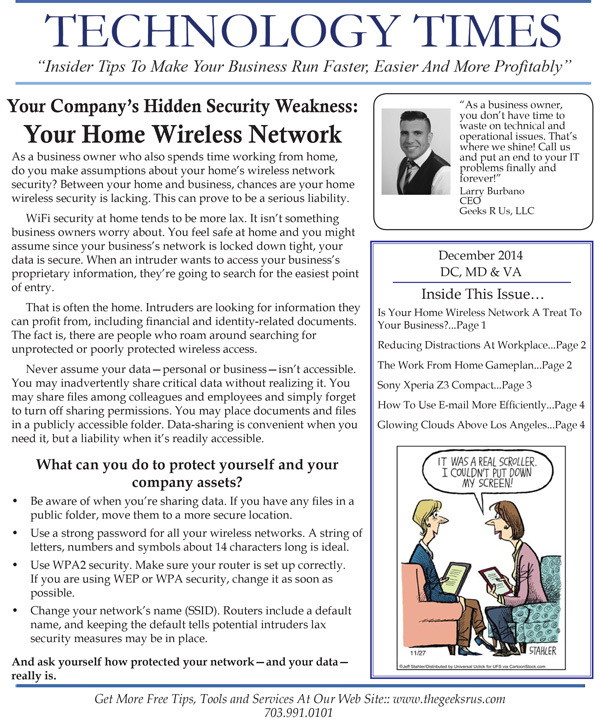 Between your home and business, chances are your home wireless security is lacking. This can prove to be a serious liability. 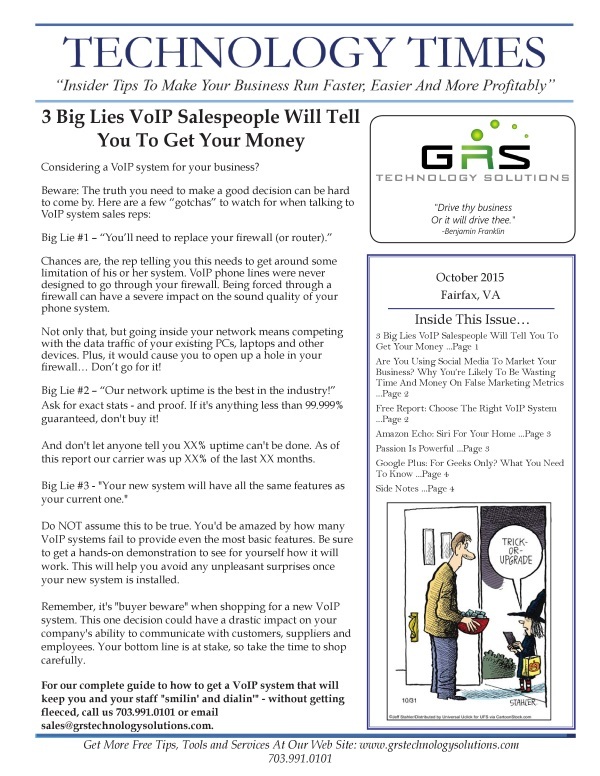 October Newsletters: This Halloween…Who’s Keeping An Eye On Your Computer Network? 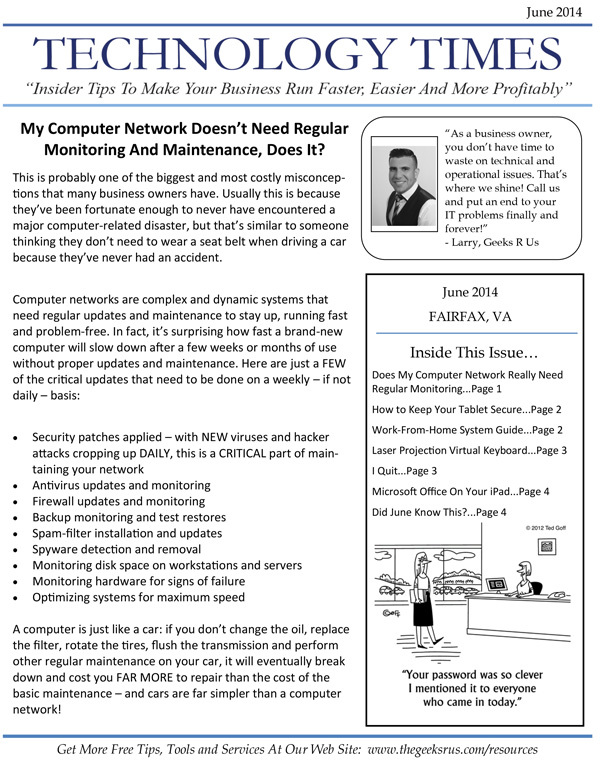 Many business owners and managers we work with wait FAR too long to have us check and update their computer network’s health and security. 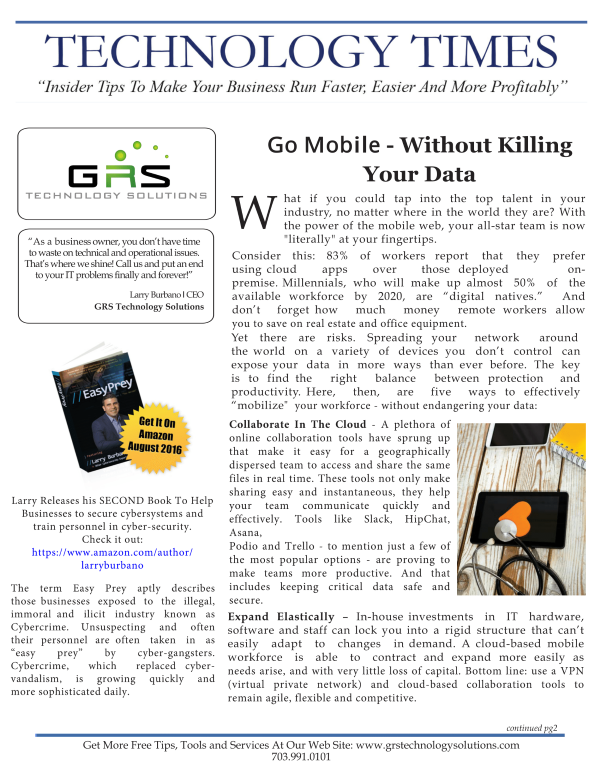 Unless we are actively performing regular daily/weekly/monthly maintenance, a nasty virus, malicious hacker, unexpected software corruption, hardware failure or dozens of other problems could catch you off guard and result in extensive downtime, data loss and expensive data recovery efforts. 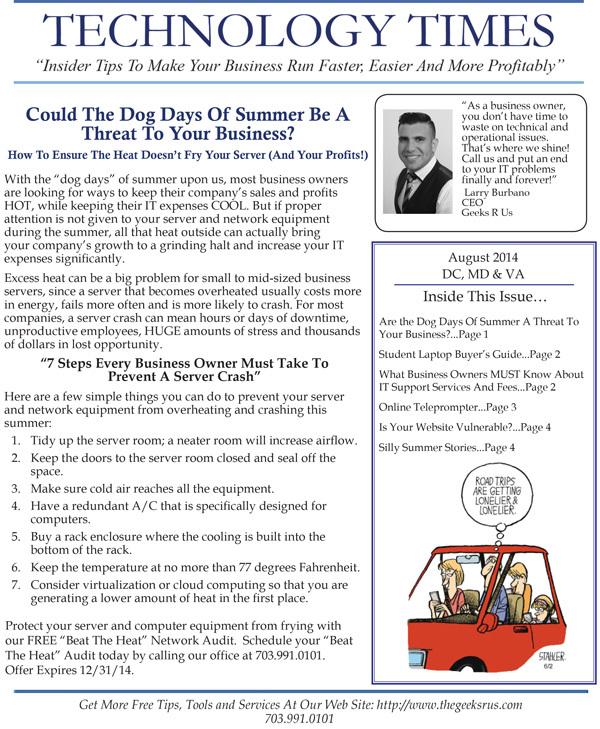 Do you have mountains of information stored on your server that you’ll never use, but feel like you should keep? You are not alone. 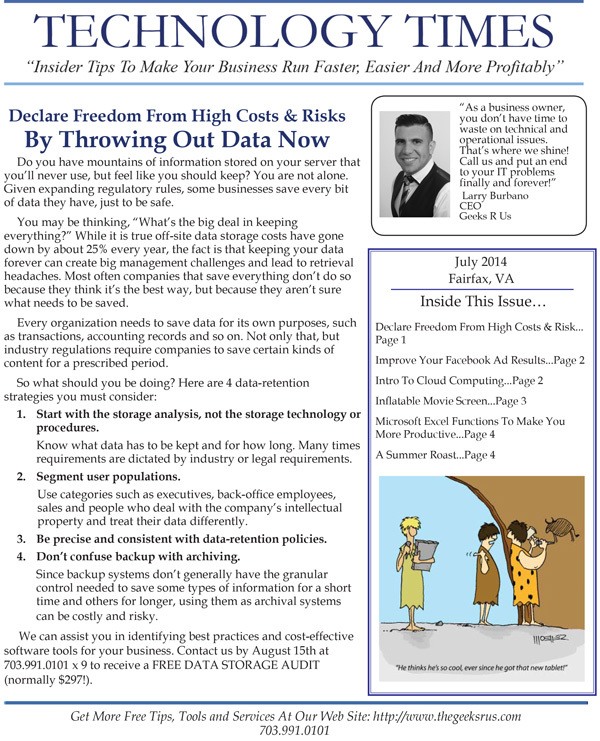 Given expanding regulatory rules, some businesses save every bit of data they have, just to be safe. This is probably one of the biggest and most costly misconceptions that many business owners have. Usually this is because they’ve been fortunate enough to never have encountered a major computer-related disaster, but that’s similar to someone thinking they don’t need to wear a seat belt when driving a car because they’ve never had an accident.